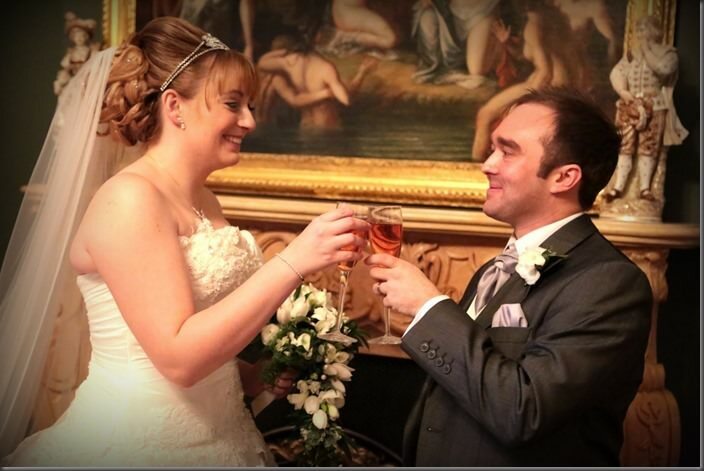 Alison and Mark celebrated their wedding day at Allerton Castle with an elegant white & silver winter’s theme. 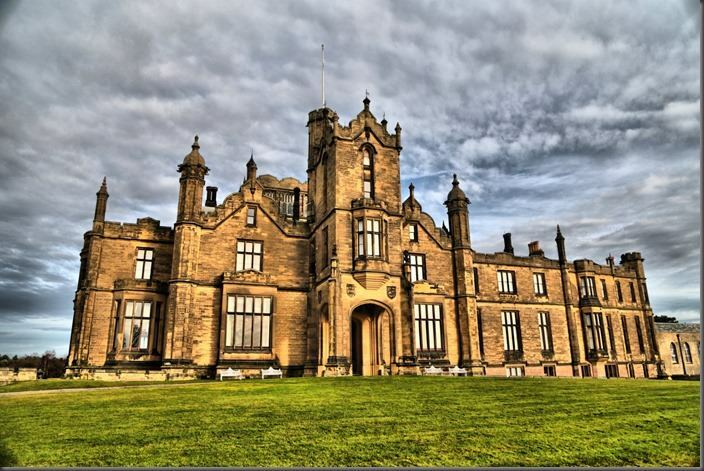 I will never forget the feeling I got when the car turned on to the driveway at Allerton Castle and I just knew that we had found our venue. I had goose bumps. The building itself looked so beautiful. Mark was very level headed and pointed out that we didn’t know what the inside would be like, but when I walked in I just knew that we had to book Allerton Castle no matter what. 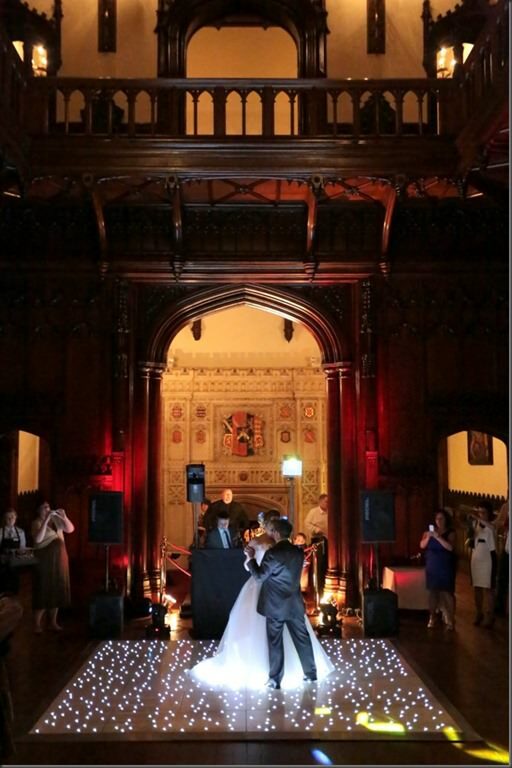 The staircase, the grand fireplace at the top of the aisle, the carvings, the dining room, the billiard room – they all offered the wow factor. 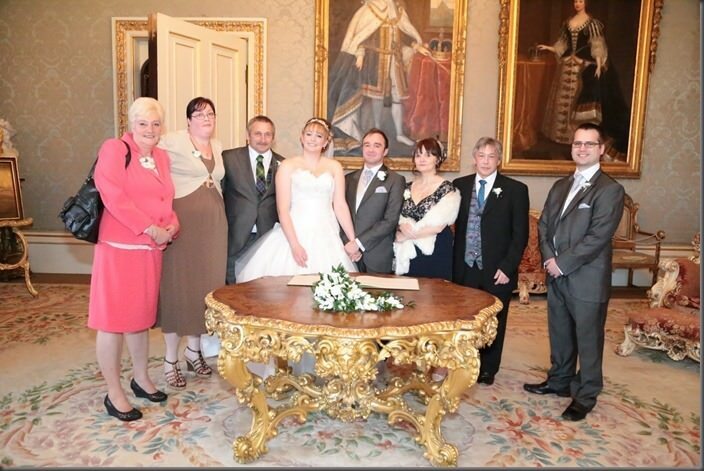 I’d without hesitation recommend Dine at Allerton Castle to another Bride & Groom. The venue is beautiful and exclusively yours for the day. The food was delicious and the service was second to none. Lyndsey, our Event Manager, was fabulous, offering me a helping hand along the way and enabling us to have everything we wanted to make our day exactly what we wanted. On the day Lyndsey kept everything running smoothly making sure we kept to our schedule and that everyone was where they needed to be when they needed to be there. 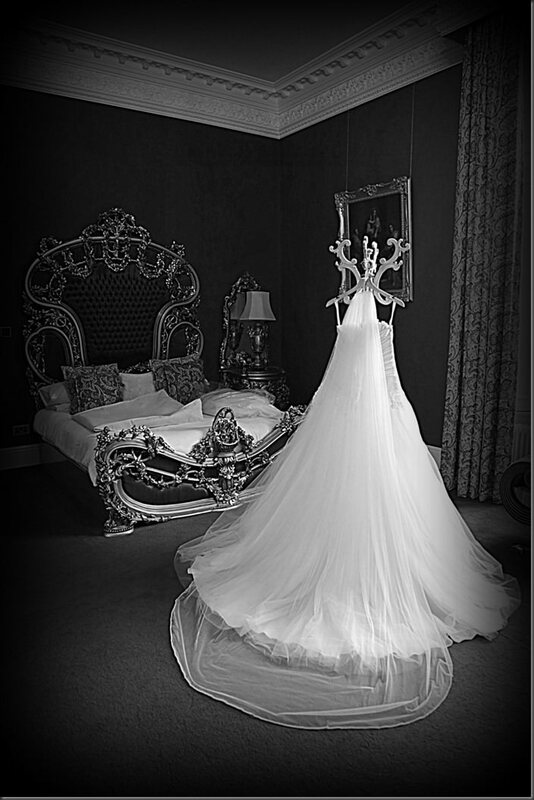 My wedding dress was Duchess by Brides Desire. 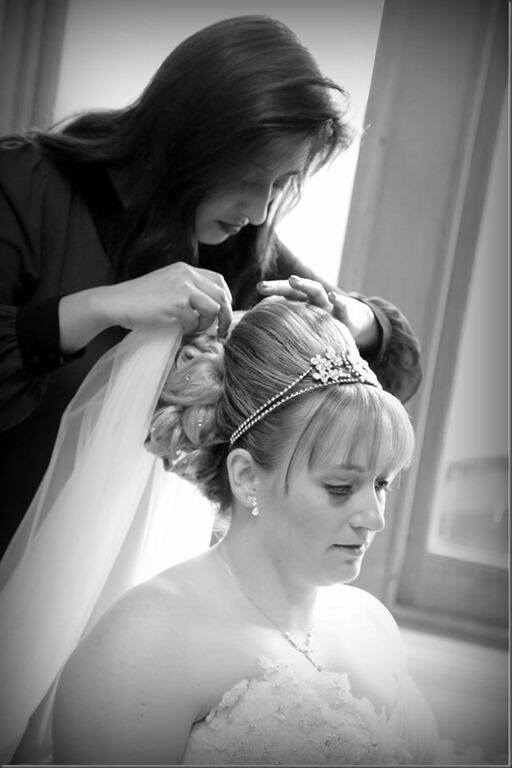 I bought it from Destiny Prom and Bridal on Linthorpe Road in Middlesbrough. I had a bouquet made up for Ranunculus, Tulips, Amaryllis, Freesia and Ivy trails . All of the flowers for the day were provided by Twisted Willow Floristry, who worked really hard with me to decide on what the final arrangements should be like and listened to my preferences and concerns then put me at ease with some great suggestions. We didn’t have any bridesmaids – my dad had asked me, “Why do you need bridesmaids when you’ve got me?” and I just knew that my dad was the only bridesmaid I needed! 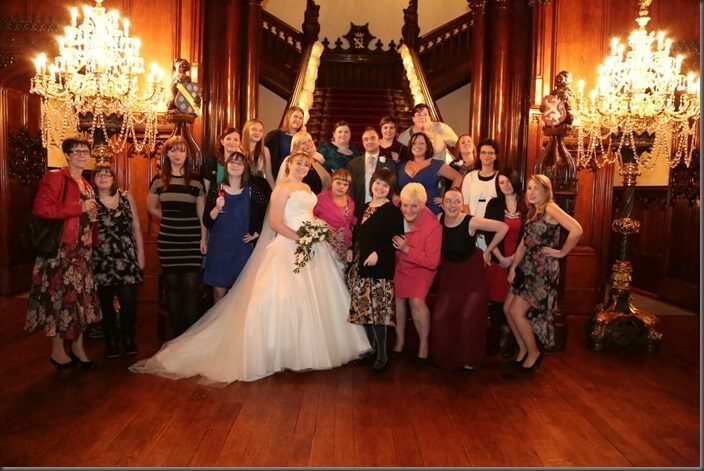 My favourite part of the day was walking down the aisle with my dad and standing at the front with my dad and my husband-to-be either side of me and our friends and family there looking on. It was the proudest moment of my life so far. The groomsmen hired their suits from Debenhams. They had grey suits from the Jeff Banks Silk Collection with a silver stripe waistcoat. My dad had a custom made ‘Watson’ tartan waistcoat that had been made as a surprise for him on the day. Our dinner menu was simple but very delicious. For the starter we had Goats Cheese and Shallot Tarts. The main course was Pork with Colcannon Mash and Vegetables and the vegetarian option was Toad in the Hole. For dessert we had Chocolate Fudge Cake but I had Cheesecake. We also offered guests Dine’s house red and white wines with their meal. Our wedding cake was a custom design made by Alison The Cake Lady, Harrogate. It was a 4-tier ‘Snow Queen’ castle with turrets and a clock showing 3 o’clock – the time that we got married. It was glittery so that when the light hit it from different angles it looked icy. We had a vanilla flavour tier, a chocolate tier, a toffee tier and a lemon tier. I have got to say that it definitely tasted as good as it looked! 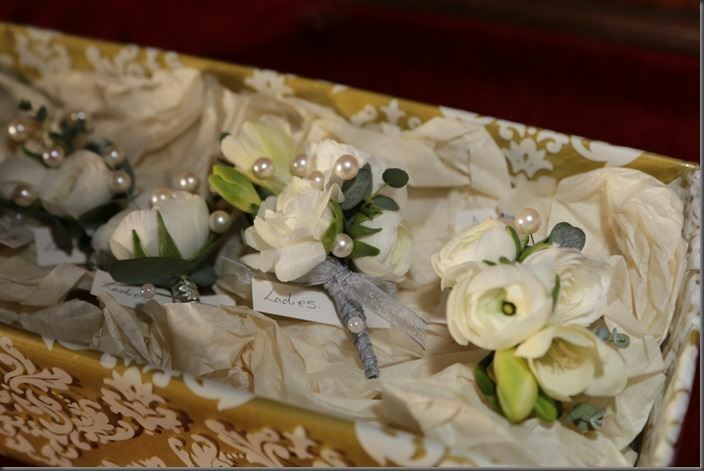 Function 54 provided the seat covers, table swags and napkin rings. Tahlia was fabulous and spent time talking through my ideas with me and making sure that everything was exactly how we wanted it including providing the dressings for the cake table after our original supplier let us down at short notice. I would recommend Dine to another couple because we had such a positive experience working with Lyndsey to plan our wedding. Lyndsey helped us with more than just planning the food and drinks menu and took the time to answer even my most silly questions to help put me at ease when I was getting tense. The staff who served the food and drinks on the day were well presented, polite and well-mannered and took the time to look after each and every person attending. Nothing was too much trouble – including keeping my dessert in the fridge so I could take it home with me because I was too full to eat it on the day but didn’t want to waste it! One member of staff also helped me to sort out my veil because I kept sitting on it – it’s the little things like this that matter. The dinner and the buffet were delicious and the portion sizes were very generous. I would happily use them again in the future to cater for any other events we might have. While guests were arriving, through the ceremony and right through until the meal we had the Tyne Consort String Quartet playing a selection of songs. They were absolutely brilliant and even spent time learning a new song that I had requested them to play while we were signing the register. Throughout the meal we had Morris Williams playing the piano. He was very accommodating and agreed to let my cousin’s children play a song each for us while he took a short break. He was really friendly and an amazing pianist. For the evening entertainment we had a starlit disco provided by Coolblu. For our honeymoon we went to New York. I had always wanted to celebrate New Year in New York ever since I was a young girl. We were there for 5 nights, staying just two blocks from Grand Central Station. While there we toured Madison Square Gardens, visited Ground Zero, went to the ‘Top of the Rock’ to see the view from the Rockefeller Centre out over Central Park and down towards the Empire State Building. We crossed over to Staten Island on the Staten Island Ferry past the Statue of Liberty both during the day and at night to see it lit up. On New Year’s Eve we went into BB King’s to drink and dance our way into 2014. My advice for another Bride & Groom would be to make sure that you communicate with each other, family, friends and suppliers. A lot of people seem to think that the wedding day is the bride’s day, but Mark was involved in the planning of the wedding from start to finish helping to make the invitations, favour boxes and afterwards the thank you cards too. We shared all the important decisions. 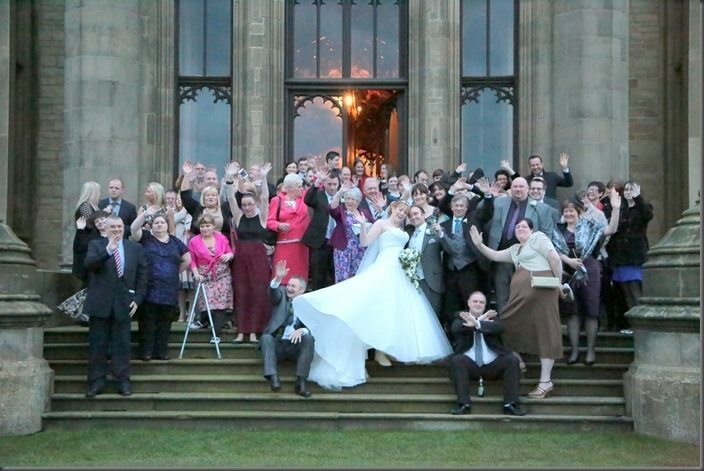 Contact us today to enquire about holding your wedding or special event at Allerton Castle.